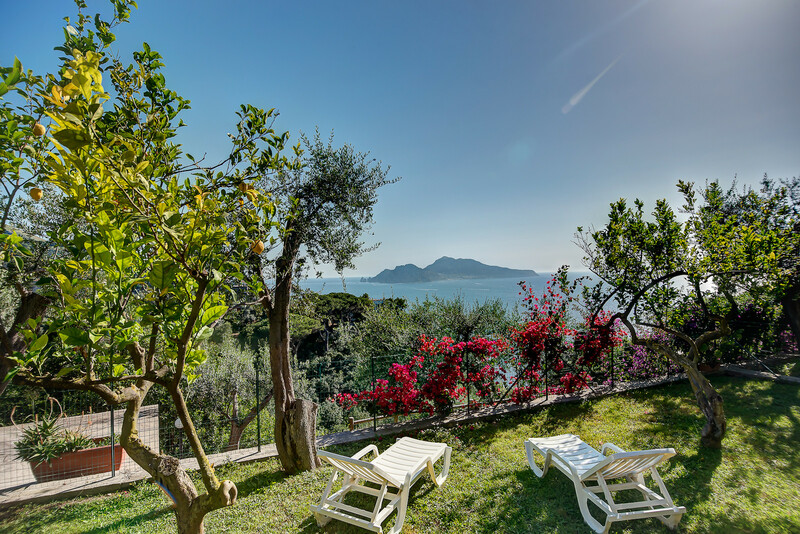 In the hills above Sorrento, and just a ten-minute drive to the beach, Maison Amelia is a spacious villa with amazing views over the bay to the island of Capri. Sleeps 6. 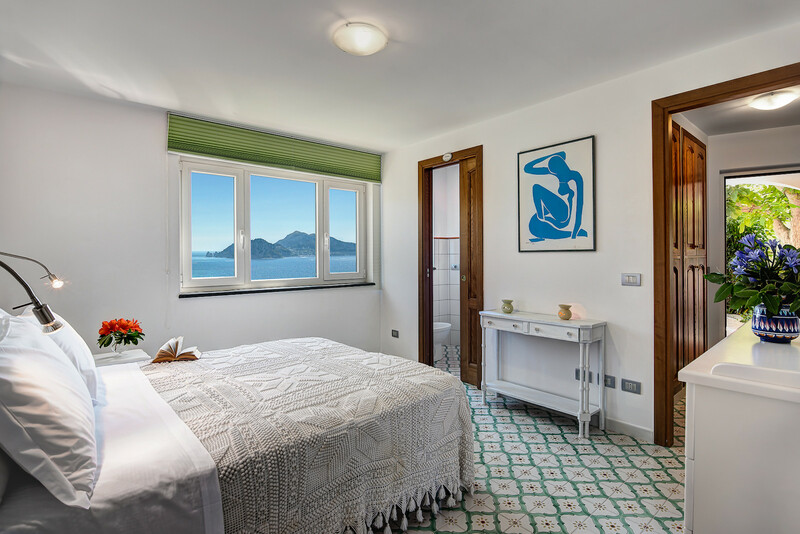 Maison Amelia sits stately above the Gulf of Naples and makes the most of its biggest asset – the breathtaking views – with picture windows and fantastic outside space. 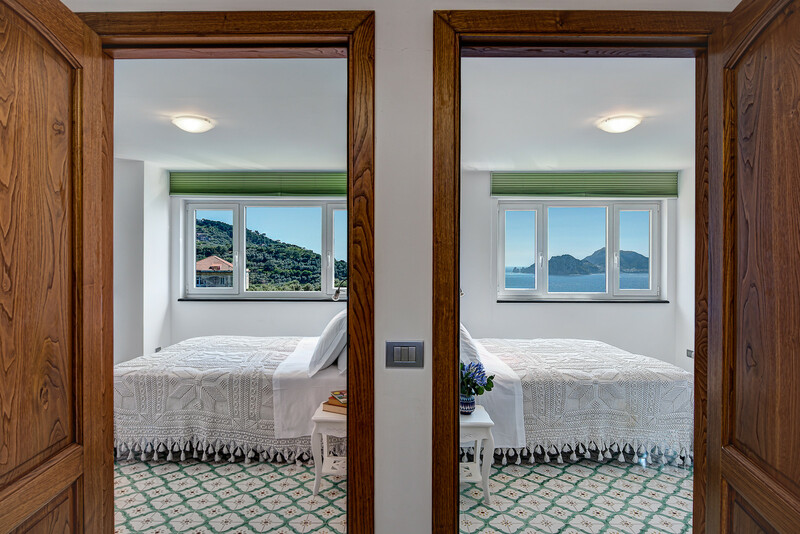 The villa is a typical Sorrentine house – stone built with white walls and characterfully designed to cling to the craggy hill. Accessed from the road above by a long stairway (80 steps), you are met with a choice of charming places to relax outside and in. 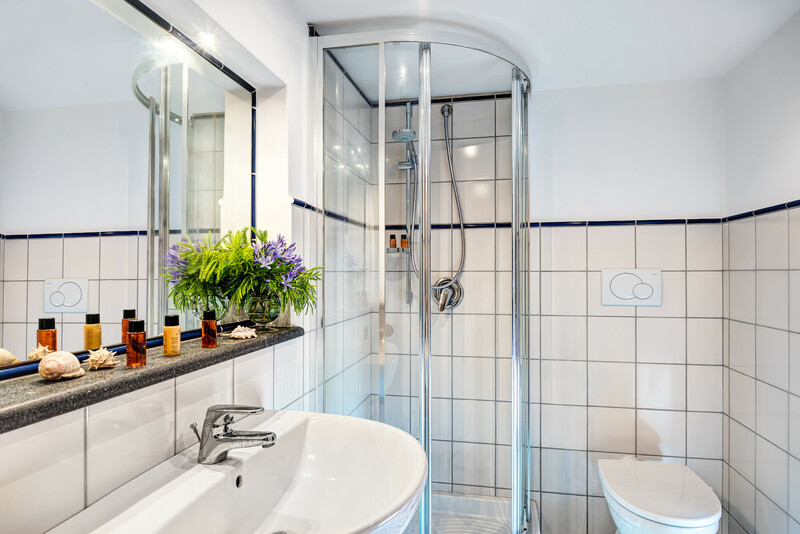 There are three bedrooms; two with en suite bathrooms downstairs and one bedroom upstairs with a separate bathroom. 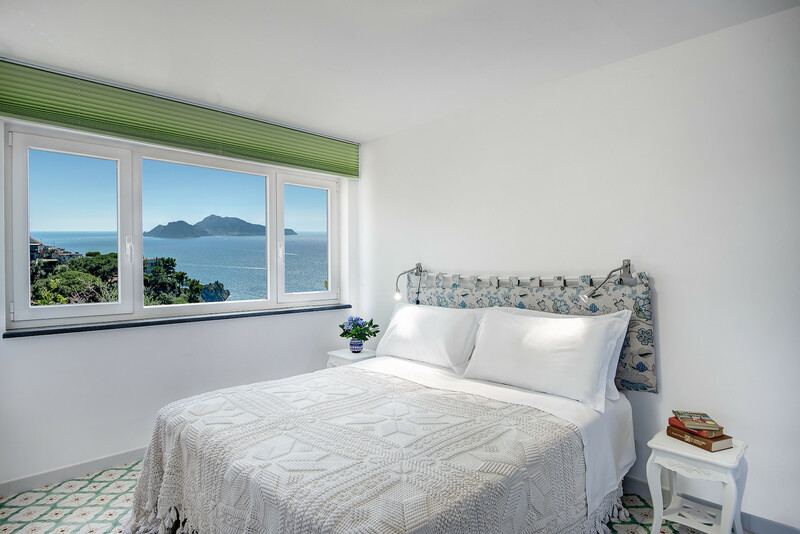 Every room has a picture window to take full advantage of the stunning views. 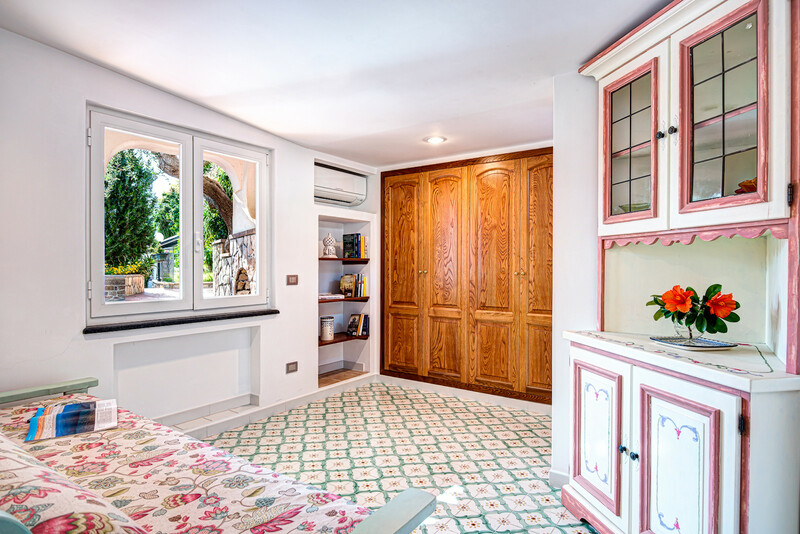 The villa is luxuriously and stylishly decorated and furnished and designed for relaxing holiday living. There is a washing machine for your convenience. 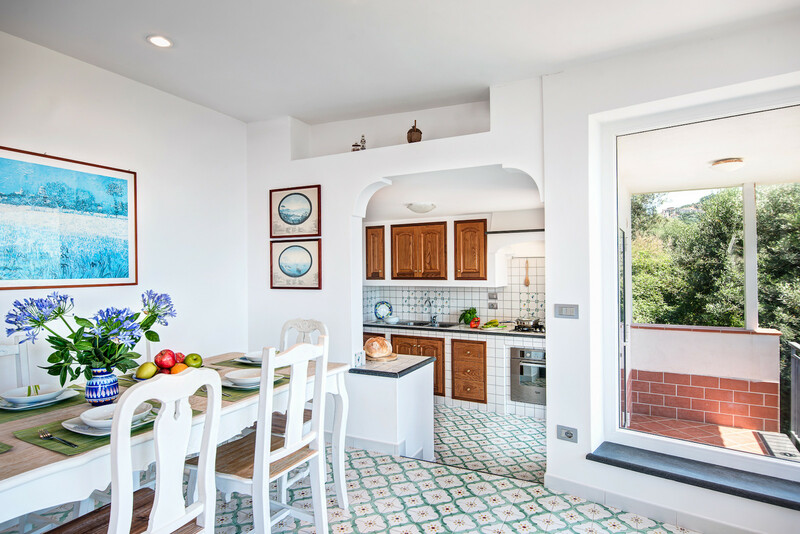 From the front door you can see through the villa’s white-painted arches to the large living and dining space and into the bright and airy kitchen beyond. 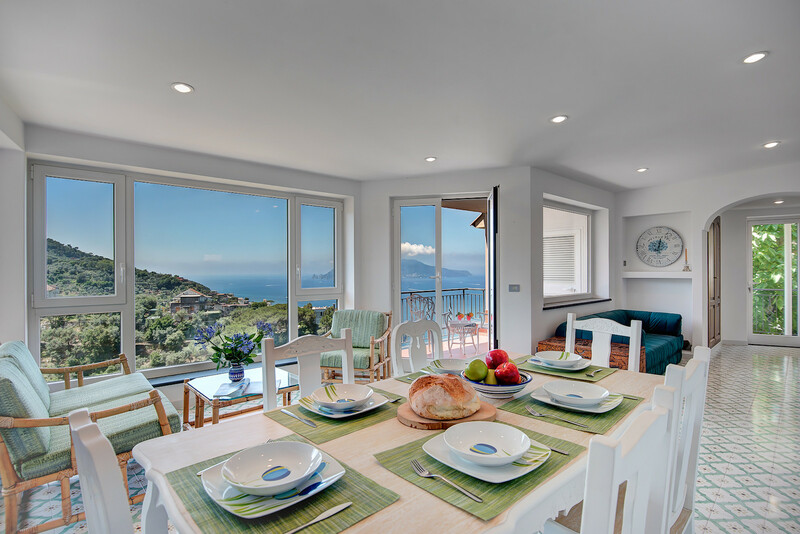 The living space has several places to sit and relax; either by enormous windows giving an enthralling view of the hills and the sea, or to cosy up and watch TV. The generous dining table also looks out onto the view, so you need never miss a minute of it. 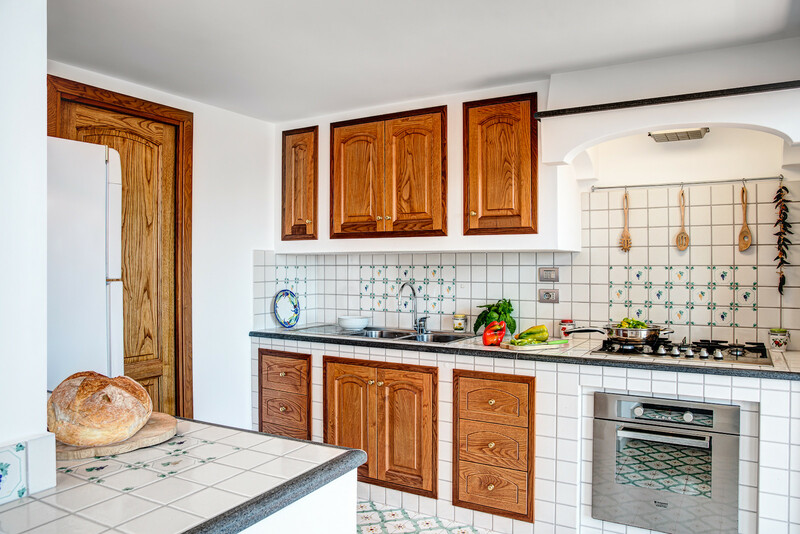 Through the arch is a smart and well-equipped kitchen with an oven, hob, fridge-freezer, microwave and plenty of space to prepare the region’s delicious produce. 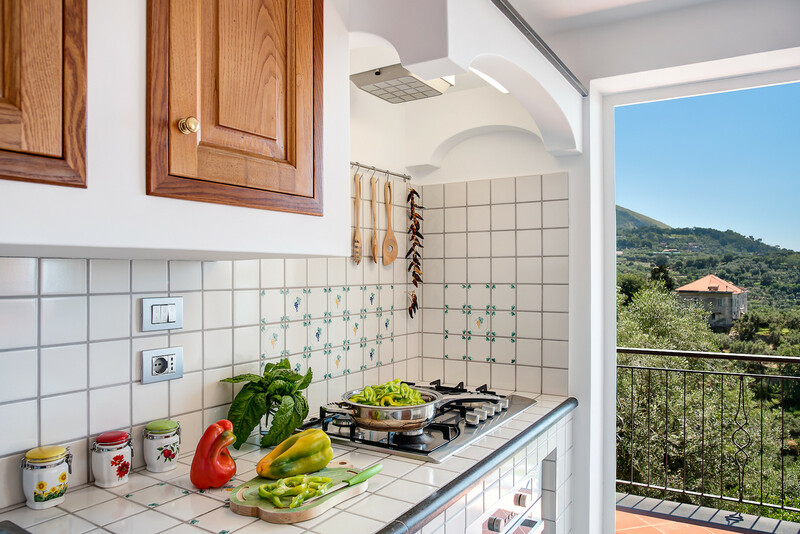 A side door opens to a balcony so that, even as you cook, you can enjoy that view. 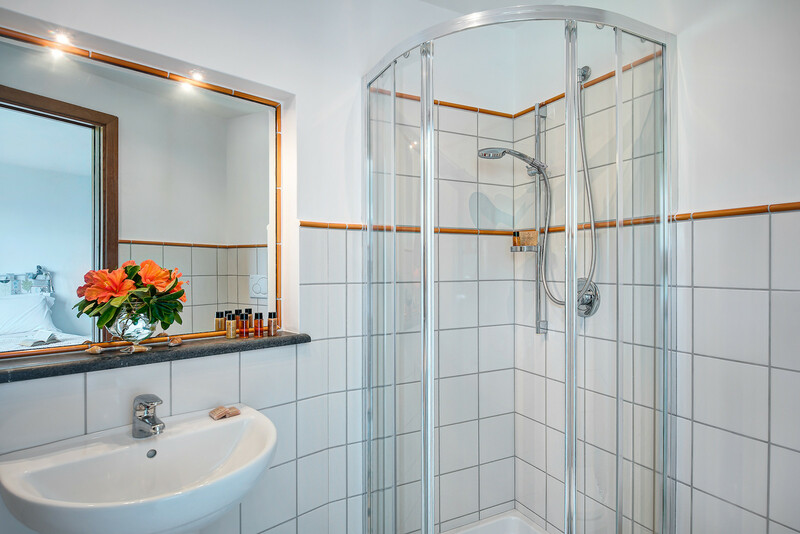 Two almost mirror-image bedrooms are downstairs and have convenient and stylish en suite bathrooms with showers and bidets. 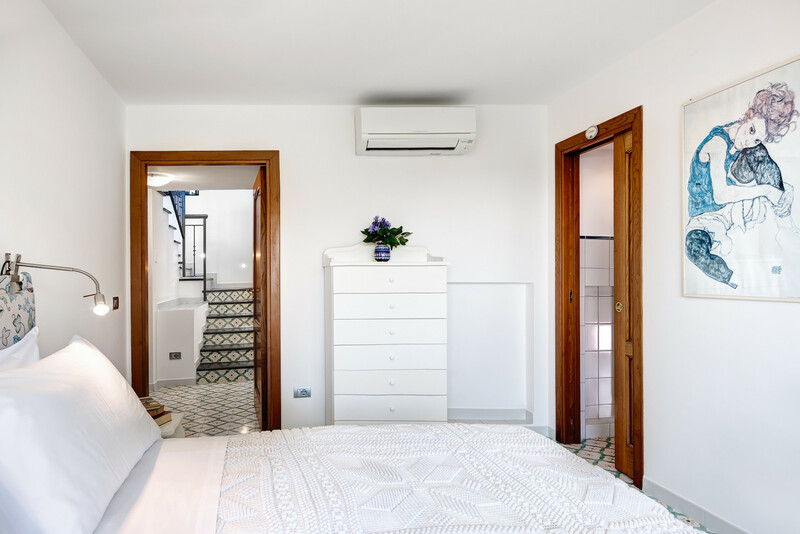 Both rooms have enormous windows to take in the sea view and are comfortably furnished with double beds and plenty of hanging and storage space. Upstairs is a prettily decorated third bedroom with two single beds and more of that beguiling view. 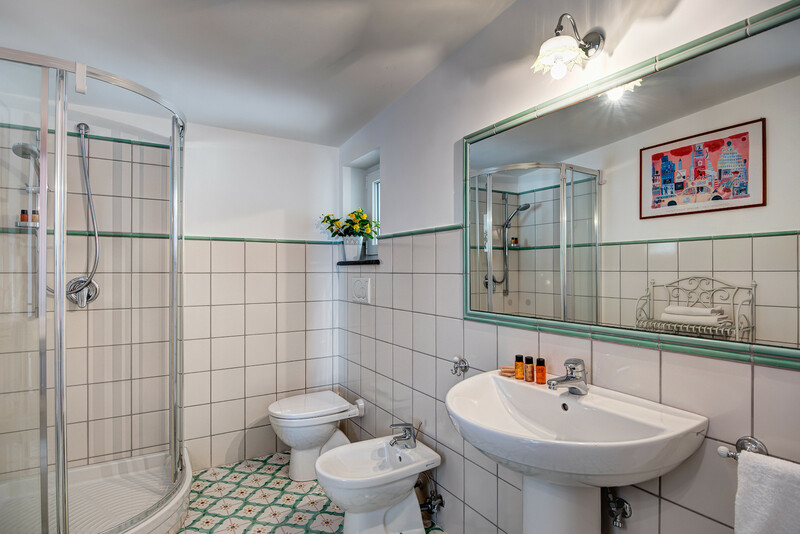 The large tiled bathroom has a generous shower and a bidet. There is parking above the property with tickets available from the nearby tabacchi shop. 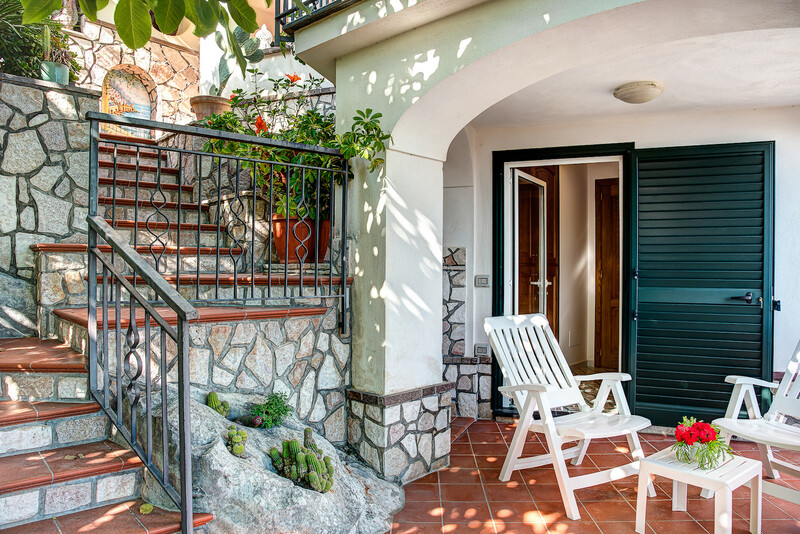 Surrounding the villa are tiled balconies and grassed terraces filled with olive and lemon trees, shrubs and flowerpots and with plenty of places to unwind with a book or a cheeky Aperol Spritz. The beach is just a short walk downhill. 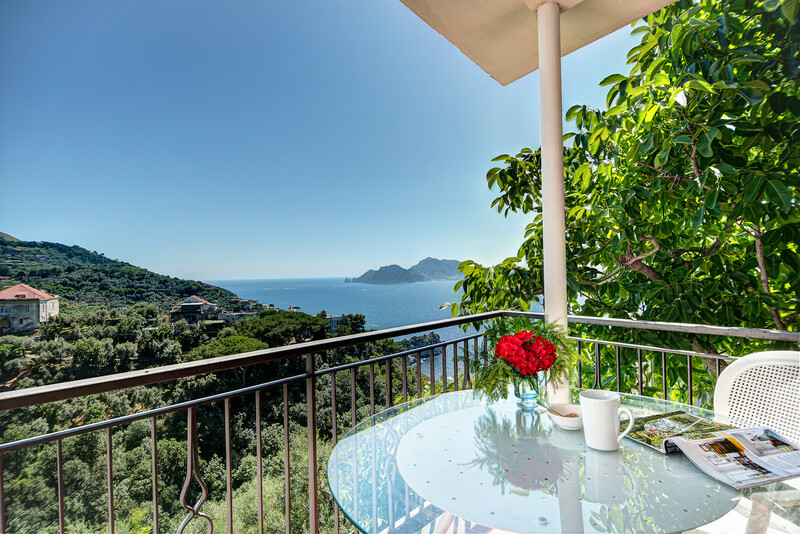 Marina di Puolo is a favourite among the locals and is blessed with fantastic restaurants and coffee shops. 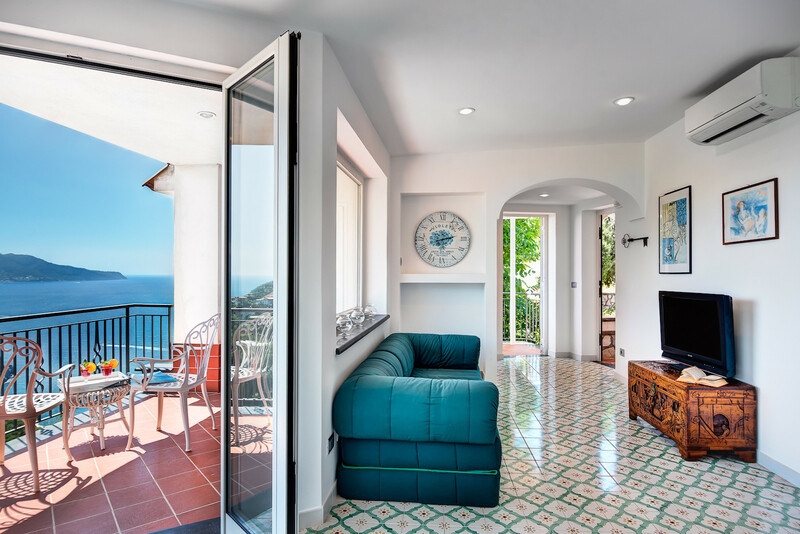 Sorrento is a 30-minute drive away with its narrow, cobbled streets, splendid piazzas and beautiful views over the water to Naples and Mount Vesuvius. 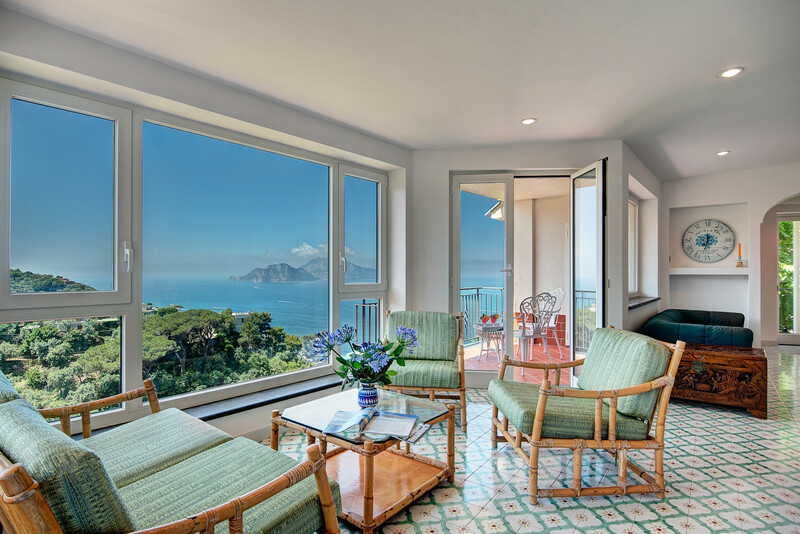 Maison Amelia is perfectly situated to explore the beautiful Sorrento and Amalfi coasts. Head over to Positano or Capri for more stunning scenery or walk in the hills on this incredible peninsula. 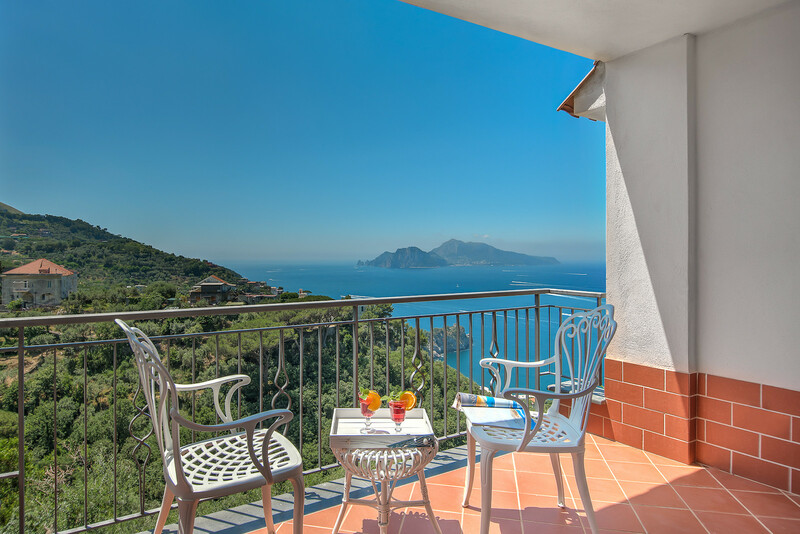 Whether you want a beach holiday, to explore the amazing Sorrentine Peninsula, or to enjoy a relaxing break in the sun, Maison Amelia will help you relax, unwind and enjoy a sunny Italian lifestyle. Please note that from 1st April to 31 October, the Municipality of Massa Lubrense applies a mandatory tax to temporary residents of €2.00 Euros per adult, per night which must be paid in cash on arrival. Only applied to the first 5 nights. 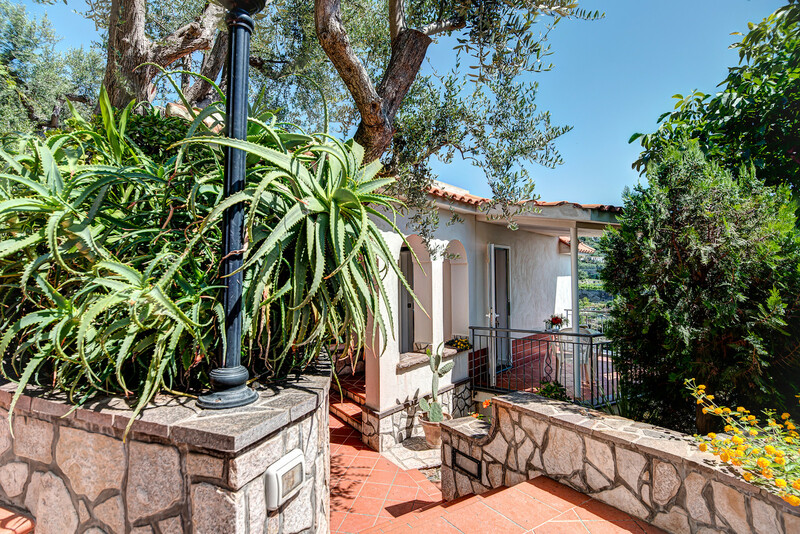 1 TV, TV Satellite (Languages: Spanish, English, German, Dutch, French, Russian, Swedish, Norwegian), garden, garden furniture, fenced garden, terrace, barbecue, iron, internet (Wi-Fi), hair dryer, 90 m² property, 60 m² plot, air conditioning (hot/cold), air-conditioned. 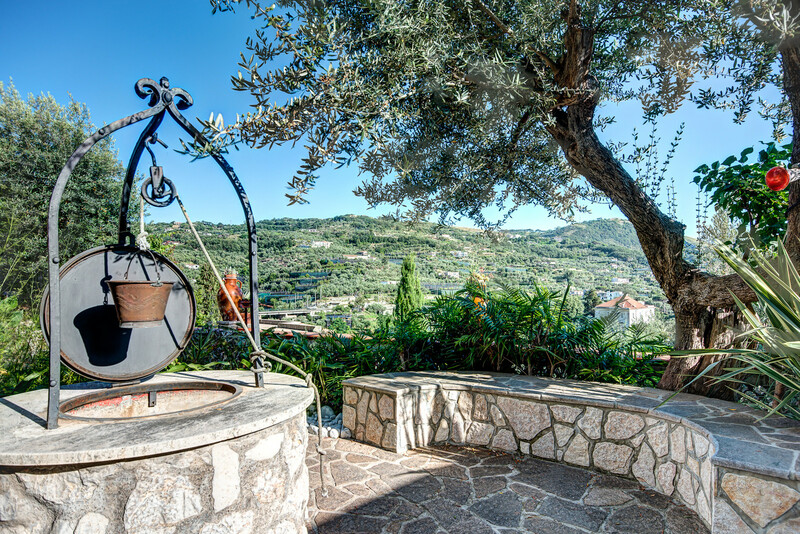 This is a great property with a fantastic view! 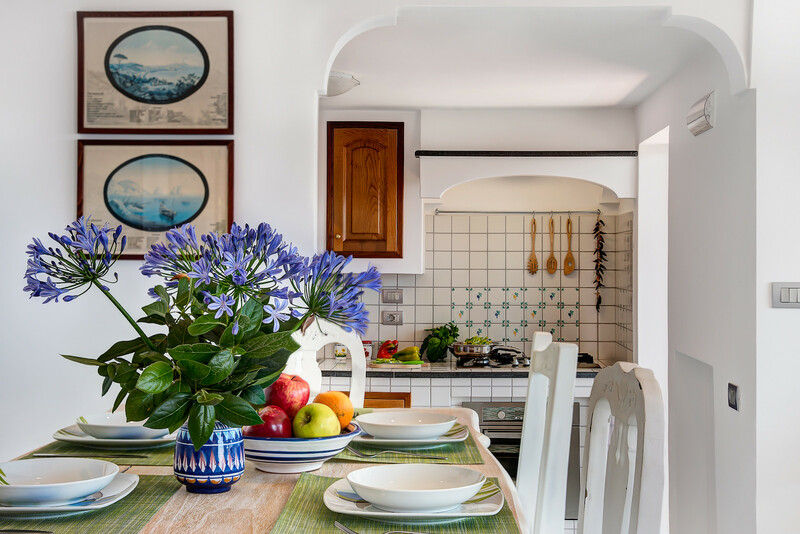 I would highly recommend casa Amelia if you want to enjoy a relaxed holiday in a truly stylish setting. A car is definitely a must for this area, although there is also a good restaurante right outside. 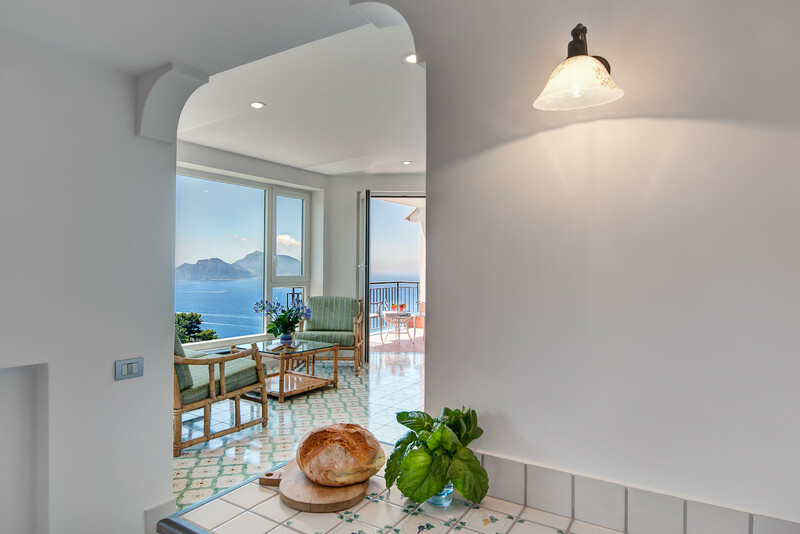 Exceptional, unbelievable view of Capri. Great property with a lot of room, if you are lucky to find these for your dates look no further and book.